Zarina Bhatty did her higher studies in Sociology from London, after that she joined Jesus and Mary College, Delhi as a Sociology Professor where she taught for 10 years. She worked as a Gender Specialist in various organizations like UN, US Aids & IAWS. 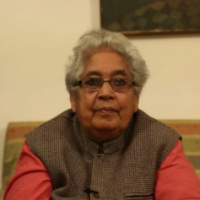 She was one of the Founding members of Indian Association for Women. She has also written a book based on her life story called Purdah to Piccadilly. Gender equality is the state of equal ease of access to resources and opportunities regardless of gender, including economic participation and decision making; and the state of valuing different behaviors, aspirations and needs equally, regardless of gender. "After doing my schooling I got married and moved to London where I studied Sociology. After coming back to India, I worked as a Professor with Delhi University for 10 years. Later I worked with US Aids and UN as Gender Specialist focusing on women empowerment. I was one of the founding members of IAWS and have written a book about my journey called Purdah to Piccadilly."